Nowadays there are too many speculations about genetics, too many people justify themselves by saying that what they have is just a not very good set of genes. At the same time, we are told that one can't get good muscles and aesthetics from training on the bars and so on. Usually, such things are said by people, who are out of shape tehmselves. But if you tell them so, I guess they will blame their genes. 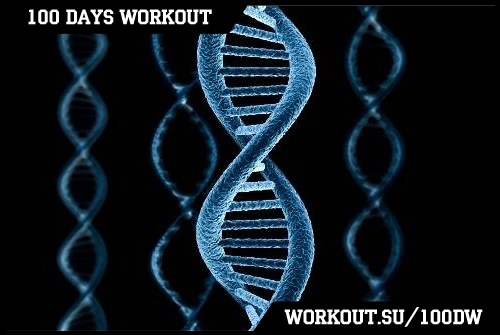 Of course there is a number of characteristics which depend on the genetics and which we do inherit (for example, the ratio between fast and slow fibers in the body, or the efficiency of the nervous system, or the length of the muscles and tendons, etc.). And that's true that some of them we can`t change, no matter how hard we try, but some of the others we can, if we work hard enough. But you know what? It's all garbage, and it doesn`t play any role in whether you achieve success or not. Treat your genetics as starting conditions. Someone have better conditions, someone worse, but in the end of the day always wins the one, who works harder! I understand when elite (or just professional) athletes talk about genetics. In their game even such little difference, like a second, can distinguish the winner from a loser. And a difference of a second can be explained by a genetic predisposition. Some people were just born for a particular sport, Michael Phelps for swimming is a good example. But it should be understood that these people compete with each other on the limits of human capabilities. When all conventional means have been used, when all the advanced steroid technology has been used too, when people perform at the peak of their mental capabilities - then they REALLY have got to the limit, the game will be won by the one who can go beyond. But are you going to become an Olympic champions? Or you are just working out to get a better shape, to become healthier and stronger? Well, good for you because anyone can become better, just if he/she will starts to exercise and follows the diet. Anyone can become even much better if they train smarter and harder and follow the diet more seriously. Ofcause, it will take more time for some people and less for other people, but in the end the result will come to everyone. Now I'll tell you a little story. This story is from the book of Dale Carnegie "How to Stop Worrying and Start Living". And it is instructive. Once I visited a home of a happy farmer in Florida. But when he purchased his farm in the first place, he was nearly driven to despair. Earth was unsuitable to grow any kind of crops. It was impossible to grow vegetables or raise pigs. On the site grew only holm oaks and rattlesnakes were carried out. But eventually it dawned upon him. What if we make minuses into pluses? Why not to take advantage of rattlesnakes? If someone doesn`t understand the last sentence, then there is a saying: "If life throws you a lemon, make lemonade!". This applies to genetics. Too many people started calling their laziness genetics, rather than just to go out and start changing their life.